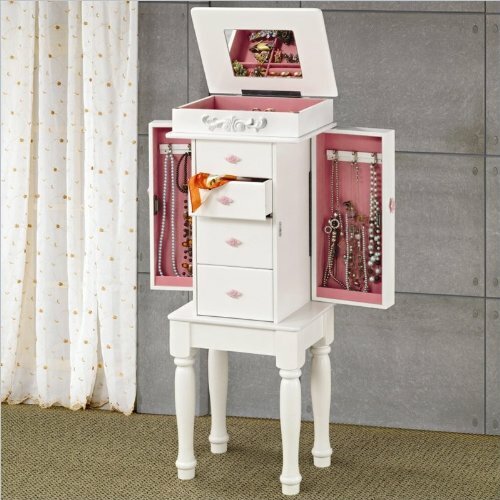 For a splash of color in your home decor and for a jewelry storage solution, make sure to check out the stunning Coaster Traditional Jewelry Armoire in white, with a drop of pink on the inside. It will ensure your jewelry’s well-organization and safety while bringing to your home a touch of glamor and elegance, wherever you decide to place it: in the bedroom, hallway, dressing room or even the bathroom. Compliment your home decor with this versatile and unique piece of furniture, designed specially to bring a subtle splash of color to your home and efficiently store your valuable jewelry items, saving up your time and energy while dressing up and accessorizing your outfit. Fun and creative, the matte white jewelry armoire is a statement piece, necessary in every home. It’s covered on the inside with pink hardware and felt lining and it doesn’t imply a difficult assembly. On four standing legs, it will keep your entire jewelry collection safe and organized, due to its four main drawers, which can hold rings, earrings and bracelets, two side opening doors with multiple necklace hooks and an additional mirror on top, so you can adjust your outfit with accessories and jewelry without having to search for a different mirror or going to another room. 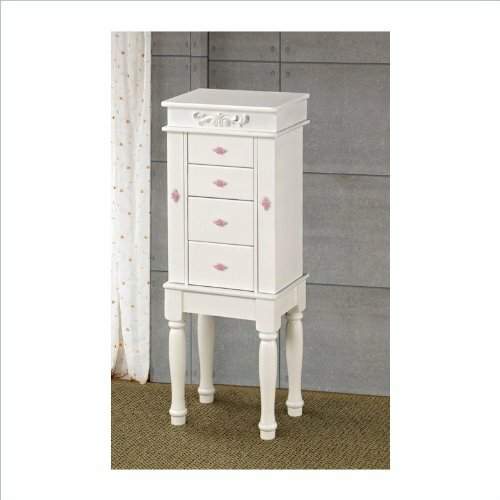 Manufactured in an elegant design with a pink color accent that will bring a contrast to your home decor, the Coaster Traditional Jewelry Armoire is the perfect piece of furniture with an innovative storage system that will delight your eyes each time you are dressing up and plan on going out. Its unique and beautiful style combined with practical 13″(L) x 9.5″(W) x 35″(H) dimensions, make it a great acquisition and a long-lasting investment for your home.